Poetry can really liven up the classroom and because of the wide variety of styles and topics, every student is bound to find a poem that they love. 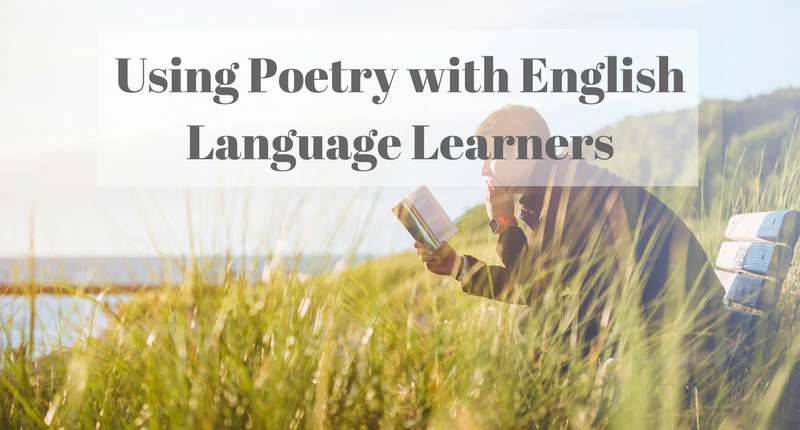 Poetry can also expose students to authentic English that is used in real life situations. Students can also see how words can be used freely and creatively which opens their minds up to the possibility of what they can do with the English they already know. Poetry can also be used along with other materials when you are introducing new vocabulary, new language structures and even more sophisticated writing such as rhyming. Also, short poems can explore an idea using a shorter amount of text than a story or an essay. Many English Language Learners come from backgrounds with a rich literary culture, exploring translated versions of these poems can enable language learners to share their culture and feelings with fellow students. Where Can I Find Poems? Thanks to the internet, finding poems is very easy. You can simply search for a topic or if you remember some lines of a poem you would like to use, you can simply type this into a search engine and you should be able to find the poem in the search results. There are also some specific, level-appropriate poetry lesson plans from the British Council. What Do I Need to Consider When Choosing a Poem? The main thing to think about when choosing a poem is the level of language in your class. If you have to explain most of the poem then chances are this won’t be the fun activity it should be. However, students don’t have to understand every single word, as long as they understand the overall meaning of the poem. Of course, you should think about what might be difficult for your students before the lesson and plan on pre-teaching some of the vocabulary, or giving visual aids for some phrases. Spotting differences between poems and stories – find a poem and a short story on the same topic. Get students to read the two in groups and make a note of the differences in length, style, content and get them to share them with other students in the class. Also, ask them to discuss which they prefer and why. Illustrating a poem – Get students to work in pairs. Give the same poem to all pairs and get the students to read the poem in pairs and then illustrate the poem to show its meaning in pictorial form. The students should then present their illustrations and describe what they think the poem means to the other students. Discussing a topic – Poetry can be used along with other materials to help introduce new vocabulary related to a topic. It can also be a chance to go into the language in more depth. You can explore ideas such as why the poet chose this word? How does the word make you feel? Students might want to pick one word or phrase that they like the most from a poem and work in pairs to write down as many other similar words or expressions as possible. Students can then share their findings with the class. Reading out loud – Choose a short, lively poem for your class and read it aloud together once. Then divide students into pairs and get them to perform the poem. You’ll need to get them to think about what the overall meaning is and how they should use their voice and expressions to convey this meaning.